I am absolutely thrilled and tickled to share that I had a page picked up for publication by Creating Keepsakes Magazine! I have long wanted to be in Creating Keepsakes, but they only pick up five layouts a month, plus they have all the Hall of Famers and such to choose from. So, I figured my chances were pretty slim. Nevertheless, I made it a goal of mine to keep submitting to them all year in the hopes that something would get picked up. So, you can imagine my surprise and delight when I got the e-mail! Yahoo! The page will appear in February 2008's Reader's Gallery. I can't wait! 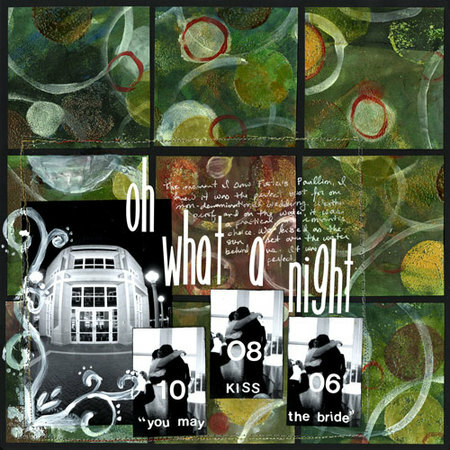 In other news, here's a quick sneak peek at the project I created with October's awesome altered kit at Serendipity Scrapbooks. Don't miss picking up this fun kit! Art Inspiration Thursday: Week Two! 1. I started with a white piece of paper and used three color of watered down acrylic paint to fill the space (green, blue and brown). 2. I stamped circles with variously colored pigment inks (yellow, brown, green) and embossed them with clear embossing powder. 3. I covered the entire page with a layer of green Walnut Ink TintZ (it’s translucent), and wiped it off of the embossed areas. 4. 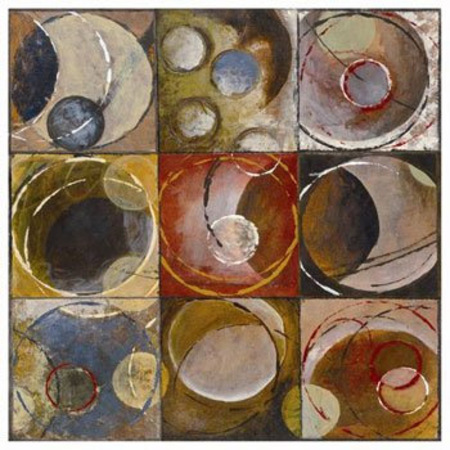 I used gesso and red acrylic paint to create more circles (painted). 5. I stamped some more circles with green pigment ink and embossed them with clear embossing powder. 6. I sprayed water all over the layout and then sprinkled clear embossing powder randomly. I used a heat gun to emboss those areas. 7. I used a darker shade of green Walnut Ink TintZ over the entire page. 8. I cut the page into 3.75 squares and used various shades of Walnut Ink TintZ to make each square a slightly different color. 9. When the squares were dry, I affixed them to a piece of Black Cardstock. I painted the scrolly design in the left corner with gesso. 10.08.06 is the date we got married. The art inspiration pieces for week three are already posted, if you want to play along this coming week! I hope you do! Design Basics for Creative Results by Bryan L. Peterson. I've never bought a design book before, I mostly go off of intuition, but I thought it would be good to actually make some conscious decisions! I love books that are full of techniques rather than projects. Projects I can invent, I want know how! From my brief flip through, this seems like a nice mix -- the projects are all technique based. I'm also a transfer addict, and this books seemed to offer a few ideas. This book is all about hand carving stamps, which is a particular fun favorite of mine! However, I'm completely self taught as to how to do it, so I thought a book might speed up my learning curve. One of my absolute favorite scrapbooking magazines! 2. I'm working on October's Altered Kit for Serendipity Scrapbooks. I can't say too much, but it's really cute and I'm kind of thrilled with how mine is turning out so far. I'm not going to have time to finish it for at least a week or two and it's killing me to have started it and have to walk away. I should have just left everything in the box, but I wanted to play with all the new stuff! 3. I've got half of a quilt on my ironing board. The deadline is fast approaching for the 2007 Journal Quilts and I have to finish mine and get it sent off to Texas by the end of the month. 5. I bought a Wacom Tablet and I'm really excited to explore the possibilities. I've done a little bit of work with it, creating some digital fabrics and then printing them out to use on my Journal Quilt (see #3). 6. I had a lot of fun doing last week's Art Inspiration Challenge and want to get to this week's. Of course, there are a million other challenges that I also want to do, but this is my top priority right now. 7. I'm waiting to receive my September Design Team goodies from Just Let Me Scrapbook. 8. I have a completely unopened kit from Scrapologie. It arrived sometime this week and I have had no time to even open it up and finger the paper! So sad. 9. I got an ATG gun! After refilling my Hermafix Dotto for the one-thousand-and-eighty-fifth time, I caved and bought the red ATG gun. I haven't had a chance to use it (because I haven't scrapped all week) but I'm very much looking forward to fewer refills for a better price! 10. Dear Jane is weighing heavily on me. I haven't made a new block in months and months. It's not that I don't want to, it's just that so many things are getting in the way. I did buy the fabric for the sashing last month, so I'm moving ahead, albeit slowly. I have class on Wednesday and I'm hoping to find time to do something in the next day or two or show up empty handed...again. So, that's it for now. Hopefully I'll have some projects to share sometime soon! Serendipity Scrapbooks offers a new scrapbooking challenge every day (and sometimes more than one). They have also recently started up a very cool new challenge, called "Dear Diary," which, "celebrates the every day by telling your story to your Dear Diary. This is where you will find journaling prompts and tips to help you on your way. Tell your weekly story about your family and your daily routine." I know I've blogged about the "This is Me" Challenge before. It's an art journal challenge and a lot of fun. It reminds me a bit of Emily Falconbridge's "Deck of Me" challenge, but larger. The "One Little Word" challenge blog caught on fast! The creative team over there posts a new word every other week and challenges you to create a layout inspired by that word. The idea for the challenge was inspired by scrapbooking celebrity, Ali Edwards, whose blog is always full of inspiration. Of course, I must mention the sketch site Pencil Lines, which inspired Altered Pencil Lines. The former is a site where a new scrapbook sketch can be found each week. The latter is a collection of artwork (not scrapbooking layouts) that are inspired by the Pencil Lines sketches. It's a symbiotic relationship. One of the best known challenge sites, is The Effer Dares. I think this was one of the first challenge blogs out there. The Effer Girls are so famous, they've even released a book. They recently lost their site when blogger crashed out and they've moved it, but they recently had a server crash. Be patient. It's worth it. I love the Pub Ad Inspiration Challenge. I wrote a long post about it here. A new ad is posted every Monday to inspire you to create a layout. I really like "How Much Is Too Much." It's a blog that was started by a bunch of women who felt that they had too much scrapbooking stuff and would never use it up! So all the challenges are about using up as much as you can. This week, the challenge is to use twenty of the same thing and twenty different things on your layout. I'm always amazed at how clean and graphic the layouts look even with all that stuff! Those girls are amazing! I like the look of the new challenge blog: Method Playground. The girls plan to provide technique based challenges. I'm all over that! Noel Mignon runs a challenge called, "Parts of Speech." Once every two weeks, she posts a very fun you tube video from School House Rocks about a part of speech (i.e. noun, verb, adjective, etc.) and you have to make a layout with that part of speech in your title! 1. The far left strip is a piece of Basic Grey patterned paper. 2. The center section is green textured Bazzill which I embossed (with Fiskars Shape Boss stencils), chalked, painted, inked, chalked again, painted more, inked more, and so on and so forth until I got the look I wanted. 3. The orange-ish strip is a piece of Crate paper all inked up. 4. 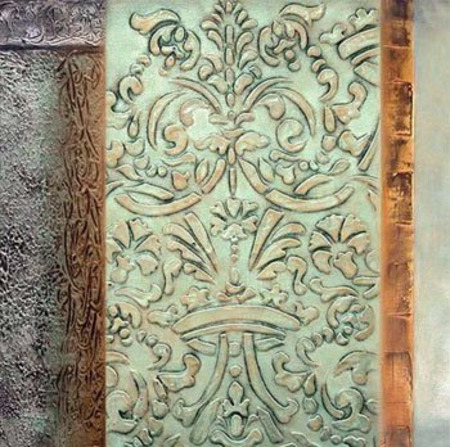 The far right strip is a piece of green textured Bazzill, which is chalked and painted. I know there are probably a million others that I've missed, so leave me a link if you've got a good one to recommend! For this weeks challenge, I was inspired by one of those "sharing my work" emails. 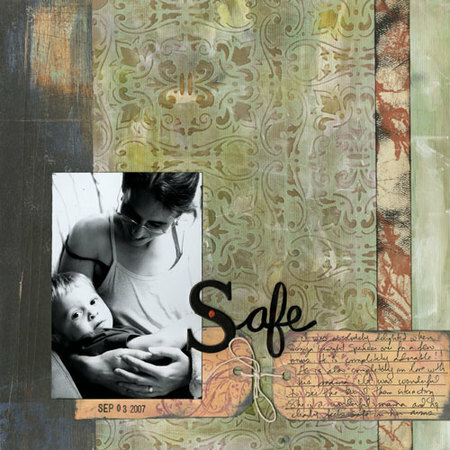 I love love love this layout by Julie Balzer. This big dots pattern is one of my favorite in all the lines we have featuring it. However, I've never seen it used this way. I'm so inspired by it...I feel a scrap-lift coming on! So this week: think circles or polka dots or rounded corners. Think innovative. Then...email me those layouts or projects!! I would love to feature you on the blog...and maybe even send you some goodies??!! It's always nice to hear that you've inspired someone!